The post Freshen Your Kitchen With Replacement Kitchen Doors appeared first on Kitchen Blog | Kitchen Design, Style Tips & Ideas | Kitchen Warehouse UK. There will always be certain features of your kitchen that betray its age more than others. Naturally, any and all moving elements will be subject to more force and greater wear and tear than those with which users physically interact less – plus stains and discolouration are more likely to affect parts that are touched by hands that have been in contact with rich, oily or highly pigmented foods; something that is virtually unavoidable when working in a kitchen. Heat and moisture, too, can cause warping and problems with paint of finish texture in cheaper fittings. For these reasons, it’s easy to see why the doors of units, cupboards and cabinets in your kitchen can start to look down at heel long before other features, and why they are the first things you should replace if you want to give the space a new lease of life. Why Might I Need Replacement Kitchen Doors? One of the main problems that people experience when it comes to older doors fitted to their kitchen units is the warping of wood or the bending of hinges that results in leaves that no longer nestle into their frames correctly. Issues with hinges can often be caused by simple carelessness or the destructive habit of swinging on doors that some little ones develop, and it can be relatively easy just to replace these mechanisms if this is the case – thus ensuring that your kitchen doors no longer fail to close properly or open easily. However, this is often the simplest answer to the problem and one which tends to appeal more to individuals who want a space that is purely functional and find it easier to ignore fading colours, cracks and stains. If you want something a little more – whether you are looking to change up your kitchen area purely for personal enjoyment or because you are hoping to add value to your property – it’s really easy to go a step further. There is no need to break the bank by investing in a whole new suite – and, most of the time, even purchasing new units can also prove overkill to a degree. If it’s clear that it’s your doors that are letting you down, it’s completely possible to solely replace these and no other aspect of the room. How Do I Replace My Kitchen Doors? 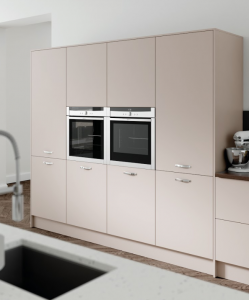 By approaching good stockists, you will quickly find that there is an extremely wide variety of kitchen cupboard and replacement kitchen cabinet doors available for you to select from – so there’s no need to worry about finding an exact match for the rest of your space. Of course, the usual preference is to select doors in the same colour and finish as their surroundings, but a more unique way of really changing up the room is to find doors that create stylish contrast with other kitchen fittings. You can choose to just highlight a couple of units with colour and keep the rest uniform, or you can go bold and add fresh colour to every door. We recommend that you keep the finish the same each time though – pairing matte with matte and high gloss with high gloss, for example – or the effect may not be as strong. Another benefit of opting to replace the doors in your kitchen is the opportunity it may afford you to add certain touches that may allow you to improve the overall feel and functionality of the space. For example, instead of replacing your hinges like for like, you might consider the addition of a soft close mechanism. This will not only prevent your doors from slamming loudly, but it will also help to improve the room’s safety – particularly if there are small children in your home, as these mechanisms make it far less likely that little finger will get trapped. Also, opting for slow close mechanisms will vastly prevent wear and tear that often results from the impact of a door hitting a frame too quickly and heavily. It’s important to first decide whether you are looking for new kitchen doors that match the other fittings in the room, or whether you’re interested in creating contrast. You should also think about whether you require additional features to enhance the space in any way. You should then write down the measurements of your existing units to ensure that all new doors will fit. The next step will be to visit showrooms and stockists to get a good look at the designs on offer. Viewing in person is far preferable to looking through pictures in brochures or online, as it’s almost impossibly difficult to capture the shade and finish of an item in a way that is totally true to life through photography alone. If you are able to obtain samples of the material your potential new door will be made from, so much the better – it’s always worth trying different colours against existing fittings to see if they match. Be sure to speak to any sales people you may encounter at the showrooms you visit, as they may be able to suggest things you haven’t thought of or point you in the right direction for the items you require. You The Kitchen Warehouse’s showroom at Hutton Moor Farm, Hutton Conyers, Ripon, North Yorkshire, HG4 5LZ. We’re open between 9am and 6pm from Monday to Friday, and from 10am to 3.30pm on Saturdays. If you need help while you’re there, simply speak to a member of our team who will be on hand to assist you and offer you advice.